ICC T20 World Cup stage is set. 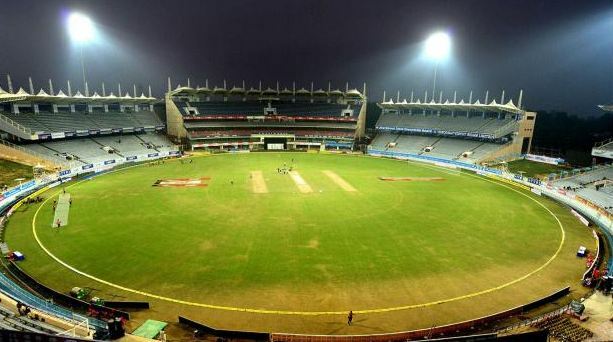 The qualifiers for the sixth edition of the highly-anticipated World T20 will begin from Tuesday (March 8) while the ongoing warm-up fixtures will continue till March 15, with some of the most-notable ones being the India-West Indies clash (March 10), New Zealand v England (March 12), India v South Africa (March 12) and Australia v West Indies (March 13), to name a few. The tournament proper will begin from March 15, with 2007 champions India taking on New Zealand in a Group 2 fixture in Nagpur. 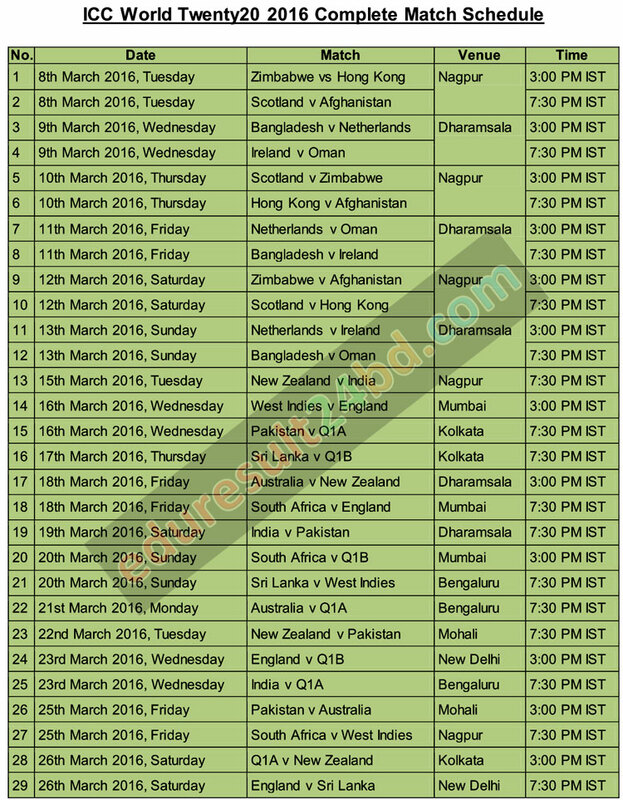 Six times of T20 world Cup is going to start in India from 08 March 2016 and it will continue till 03 April 2016. The first match will be played on 08 March 2016 at Nagpur between Zimbabwe vs Hong Kong and Scotland vs Afghanistan. 35 matches of T20 World Cup 2016 will be scheduled at total 8 venues including Eden Gardens of Kolkata, Bangalaluru, Mumbai, Dharamsala of India. After preliminary or first round matches on 15 March 2016, India will host New Zealand in super 10 matches at Nagpur. The matches of India vs Pakistan will be scheduled on 19 March 2016 at Dharamsala Venue. Semifinals are scheduled on 30 and 31st March 2016 whereas Final or grand finale will be played on 03 April 2016 at Eden Gardens of Kolkata. 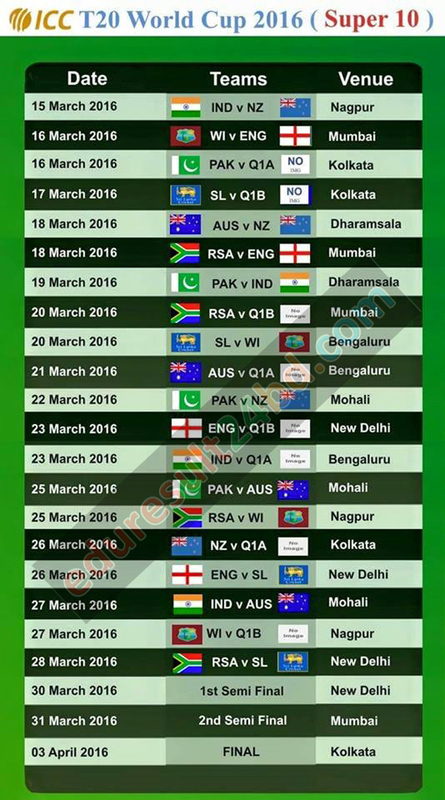 On 11th December 2015, Friday ICC has announced the Twenty20 world cup 2016 fixtures and groups. The tournament will start with the preliminary round on 8th March 2016 and the final will be played on 03 April 2016 in Eden Gardens of Kolkata. Below is the full list of features and dates.